Heroes come in all shapes and sizes. 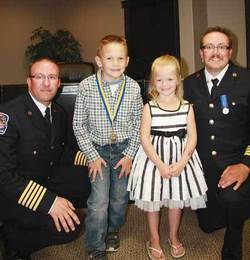 The Town of Calmar and the Calmar Fire Department honour seven-year-old Brandon Irwin for saving the life of 4-year-old Danae Seely. (L to R) Calmar Fire Chief David Brooks, Brandon Irwin, Danae Seely, and Deputy Chief Stephen Thomas. Seven-year-old Brandon Irwin of Leduc is credited for saving the life of four-year-old Danae Seely of Drayton Valley when she fell into the rushing waters of the Pembina River on July 3, 2013. It was standing room only as members of the Calmar Fire Department, Calmar Mayor Faulkner, Town Manager Rodberg, and numerous family members and friends met in the Calmar Council Chambers on July 10th to recognize Brandon’s bravery in a special way. After introductions by Calmar Fire Chief David Brooks, Brandon’s mother, Ivanna, a seven-year veteran firefighter with the Calmar Fire Department, described how she and her friend Shann Seely of Drayton Valley, along with their children, were enjoying a pleasant outing along the banks of the Pembina River. The kids were playing in a safe zone while the moms chatted a few feet away. Danae’s mother, Shann caught sight of her daughter’s fingertips just for a moment before they disappeared under the brown waters. She shouted, “Carter!” to one of the kids by the river. The thought that they were going to lose them both spurred the moms into action. Shann continues the narrative, tearing up as she relives those distressing moments, “As I’m running deeper and deeper into the water, I’m wondering which would be better, running or swimming. The water was so murky, I was afraid I'd lose sight of them.” Thankfully, Shann and Ivanna (along with other siblings) reached the children quickly. What they discovered upon arriving was nothing short of a miracle. Brandon had gotten to Danae first. In a remarkable show of wisdom, courage, and strength, he lifted and held her up above his head while holding his breath—completely submerged and fighting the current—until the rescuing arms of their mothers and older siblings pulled them both to safety. With relieved smiles, the moms knew when they heard his humorous reply that Brandon was OK. Danae was OK too—both of them just a little cold from their frightening ordeal. Fire Chief Brooks and Deputy Fire Chief Stephen Thomas then presented Brandon with a medal. The three-line inscription on the back reads: “Act of Bravery, Brandon Irwin, 2013.” According to Brooks, this is the first time such a medal has been awarded by the Calmar Fire Department. Thanks to a brave seven-year-old boy who immediately ran to help in a life-threatening situation, little Danae has the opportunity to “grow up to be a princess and get married and wear a beautiful gown.” Brandon said when he grows up he wants to be a firefighter. He certainly has the great big heart and mind of one. Well done, Brandon. We are all so very proud of you.